I’m out on Dana Point. An estuary connects the harbor with the ocean. There are thousands of boats in their slips in the harbor. In the estuary, there are competitive canoers, kayakers, paddle boarders. Along the path, there are runners, walkers and many, many dogs. The sun is beginning to break through the overcast leading to what will undoubtedly be another glorious day. 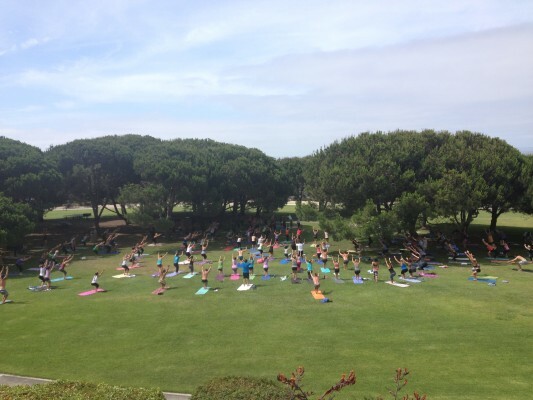 On the way back to the hotel, I climb a steep set of stairs and come upon a yoga class of dozens practicing under some shade trees in Lantern Bay Park to the sound of drums. As I get closer, I realize that the drumming has nothing to do with the yoga class but is from a Hindu wedding that is taking place at the hotel. There are hundreds of guests dressed in beautiful Indian saris and a horse decorated in finery. These are definitely not the things that I see on an early morning walk in Oakland!